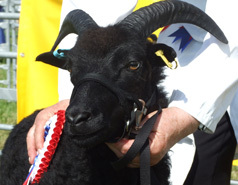 Sheep, even the charming Hebridean sheep, are covered by a raft of legislation that surrounds food animals, their traceability, welfare and transport. People new to sheep keeping can find this daunting and a bit confusing, so hopefully, the following checklist will help you wade through all the requirements. 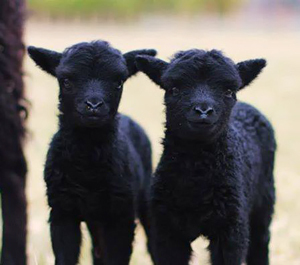 Documents from the UK government about keeping sheep can be found here. Please remember that rules change; they also vary across different parts of the UK. So although we have done our best to ensure that this website is correct and upto date, please double-check the details with the relevant Agricultural Department. For England - check the DEFRA website. For Scotland - check the Scottish Government website. For Wales - check the Welsh Assembly website. There are a number of websites (for example here) and books available that give advice on keeping sheep. 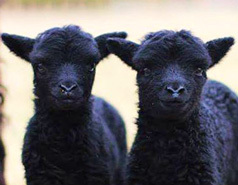 If Hebrideans are your sheep of choice, then The Society is also here to help you: both with finding pedigree animals for sale and with long term support. If you need to discuss keeping sheep we will be glad to help. Whether you keep a few pet grass mowers or a commercial flock you need to become a "Registered Keeper of Livestock". To do this you need to obtain both a "County Parish Holding (CPH) Number" and a "Flock Number". Before you can move sheep onto your land, you need to have a CPH number. If you don’t already have one, then contact the Rural Payments Agency (note, if you rent or temporarily use someone else’s land to graze your animals you can use the CPH number of whoever owns the land. If for any reason the landowner does not want you to use theirs, you can request a temporary CPH). If you regularly use additional grazing land within 10 miles of your CPH, you may be able to add the land to your permanent CPH or else apply for Temporary Land Association (TLA). To get your Flock number contact livestock registrations at the Animal and Plant Health Agency - in Scotland and Wales, contact your local Field Service Office (note - you need a CPH number before you can be allocated a Flock Number). Usually the Flock Number on the eartags will refer to the flock where the sheep was born. The only reason to change this is if a bought-in sheep not bred on your holding has lost both its tags. Please note: Rules change and may be different within the devolved goverments. Please check the relevant website for up-to-date requirements. All sheep in the UK older than 12 months must have 2 identifiers (tags) with the same unique individual identification number. One of the tags must be an electronic identifier (EID). This EID tag should, where possible, be attached to the left ear. 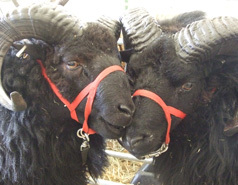 in addition to EID, pedigree breeding stock will also need to carry the Hebridean Sheep Society registration tag which ties the animal to its papers and the Society's breeding records. Information about the requirements in Scotland can be found here. Information about the requirements in Wales can be found here. In many ways, Hebrideans are a low maintenance breed of sheep. They thrive in harsh environments and cope well with bad weather. They lamb easily and are good mothers. They tend to have sound feet and seem to have a higher resistence to worms than many other breeds. However, it is still necessary to know about the general animal welfare requirements expected from a Registered Keeper. It is also useful to be aware of any health risks that may occur at specific times of the year (e.g. flystrike in summer). If you have never kept sheep before, then you should seek out some training on basic welfare tasks and the shepherd’s calendar. Your local Agricultural College / Smallholders Association /Small Shepherds Club or most other flock owners will be willing to assist you. 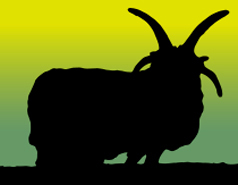 In addition, the Hebridean Sheep Society puts on summer and winter events every year and these will also help with practical skills. Your Vet will be able to advice you further about developing a "Flock Health Plan" that is specific to your situation. This is a managed approach to flock health that will help you ensure that you give preventative treatments at the most appropriate time of the year. Having a plan like this should also make you aware of specific seasonal health risks to your sheep. You may also find it useful to sign up for the free flock calendar from AHDB. This will will send you email alerts to remind you of key tasks that need to be done throughout the year. Alternatively, you can find examples of flock health plans online (for example here). However, please be aware that as more research is done, veterinary advice can alter and the information you find on the websites may be out-of-date. NADIS (National Animal Diease Information Service) provides monthly Disease alerts and Parasite Forecasts for livestock keepers. These are based on detailed Met Office data. If you have any doubts, you should discuss what these reports mean with your Vet or a Suitably Qualified Person (SQP - who will be based at any agricultural supplier that is allowed to sell veterinary prescription medicines). It is also worthwhile thinking about biosecurity measures and quarantining new stock on arrival onto your holding. There are strict guidelines about reporting animal movements to and from your land. This is to try and prevent the spread of animal diseases and it is to everyone's benefit if all animal keepers adhere to them. You have to provide details of any movement of sheep to or from your holding to the Animal Reporting and Movement Service (ARAMS). (There are a few exceptions to this rule that can be found here). You must report this within 3 days, but you can do it by sending in a paper form or by completing the details electronically. All movements on and off your holding must also be recorded in your holding register. If livestock arrive at your holding from another, you are not allowed to move any sheep (cattle or goats) off your land for 6 days (the standstill period for pigs is longer). There are some exemptions to these standstill requirements and the rules may vary between the devolved governments. Please check the relevant website for up-to-date requirements. Registered Keepers have a legal responsibility to ensure their animals are transported in a way that won't cause injury or unnecessary suffering. You can find welfare advice about transporting sheep here, here and here. One of the conditions is that animals are fit to travel. 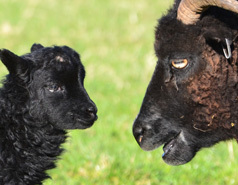 It is therefore usually not permissable to transport heavily pregnant sheep in the last 15 days of their pregnancy, new born lambs whose navel has not completely healed or ewes that have given birth within the previous seven days. However, if the journey is for the purpose of improving the conditions of birth, for example by moving them between farm premises or taking the sheep to a vet, then it is permitted to transport them short distances under 50km (~30 miles) - such journeys must not cause unnecessary pain or suffering. There are also different rules depending on how far you are going to transport your animals. If you intend to transport sheep over 65km (approximately 40 miles) then you need a Type 1 Authorisation. If your journey may last over 8 hours then you will require Type 2 Authorisation. Authorisations are valid for 5 years and you should carry it with you when tranport your animals. In addition, if you need to transport animals over 65km then you also must obtain a species specific Certificate of Competence. You will need to sit a multiple choice computer based theory test to get this. If you need to transport animals over 8 hours, then you will also need to pass a practical assessment. Both City & Guilds and LANTRA have been designated to assess for competence to transport sheep. There are also DVLA requirements when towing a trailer and anyone who took their driving test later than January 1997 will also need to take a trailer-towing test. Those with older driving licences have "grandfather" rights which permits them to pull a trailer without an additional test. However, if you are unsure about driving / reversing with a trailer attached then it may be worth taking a lesson or two from a driving school that offers this (you don't need to take a test unless you wish to). This is required for disease control purposes. It is a running record of all animals, births and deaths and records all sheep movements onto and off your holding. It should also include details of new or replacement tags. Within your register, you also need to keep an annual inventory of the number of sheep on your holding on 1st December each year. If you live in England, you will need to send this number to DEFRA (They will send you a form in late November that you must return, or submit online, by the end of the year). In Scotland, although the date for the annual inventory is also 1st December, the date of return is by 15th December. Your can keep your register either on paper or electronically. DEFRA provides a sample register on its website. Alternatively, you can order hard copies from them. You must keep your register for 3 years after the last animal in it has left the holding and, if requested, also make it available to an inspector. Further details about the holding register can be found here. Your Medicines Book is to record any medicines you administer to your stock, when, what dosage and the source of the medicines. This will enable you to keep track of the dates on your worming and anti-fly strike treatments. You need to keep your medical records for a minimum of 3 years. Full details about the recording requirements for veterinary medical products can be found here. when you buy hay (and any other feedstuff), its cost and when you started feeding it to your sheep. whether you have given minerals (note, sheep are sensitive to too much copper and should only be given minerals that are specifically formulated for them). Depending on your personal preference, your day book could be a small book you keep in your pocket (one made out of water resistant paper is good especially if you intend to use it outside! ), a desk diary or perhaps notes kept on your mobile phone. This is something you may hear talked about. It relates to those who are eligble for farm subsidiy payments from the RPA. For more details see here and here. It is worthwhile knowing what to do when one of your sheep dies as it is now illegal to bury a sheep, or even a lamb, on your own land. Fortunately, you will find that this eventuality is a long way off for Hebridean sheep. But it helps to be prepared. Ask you Vet or another local livestock keeper where the nearest incinerator is. It is useful having a couple of large, (wheelie-bin liner) black bags on hand, just in case. You could also check out the National Fallen Stock Company - though this is probably most useful for farmers with large numbers of stock. If you do ask a fallen stock contractor to come onto your land then please consider biosecurity. If you suspect that your stock may be infected with, or has died from, a notifiable disease you must immediately notify your local Animal and Plant Health Agency (APHA) for further investigation. What would you do in the unlikely event that your sheep escaped onto a road? Or if stray dogs got into your fields and injured your stock? You also need to consider personal liability for any contractors or members of the general public who may come onto your land as well as product liability for any items (especially meat and other foodstuffs) that you intend to sell to others. Unfortunately, unexpected things do happen and it makes sense to look into your insurance options. A number of brokers and firms offer specialised, tailored insurance for farms, smallholdings and livestock. It is worthwhile contacting several as premiums and the level of cover can vary widely. One of the first things you need to consider is whether your stock can escape from their field. 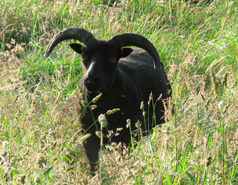 Hebridean sheep are great browsers and they often seem to prefer hedging plants and young sapplings to grass. It is one of the reasons they are used for conservation grazing. But it also means that a hedge will probably not be sufficient in stopping a determined Hebridean ewe or cheeky lamb from getting out. Similarly, their primitive nature also means that, if pushed, adult sheep are quite capable of scaling 4 foot drystone walls. So it is worth putting a stockfence around your land. It is also advisable to protect any young saplings that you want to keep with stakes and wooden guard rails (or stock fencing) - plastic rabbit guards are definitely not sufficient as your tenacious Hebrideans will easily get through these to nibble at the delicious bark and tender shoots. You can also train sheep to respect a triple wire electric fence and they will quickly learn not to touch it. An additional advantage of electric fences is that they will deter dogs, foxes and badgers from entering your field at lambing time. Note - you should buy a tester along with the rest of the kit to check the effectiveness of your fence lines. However, if you do use electric fences, you should check your Hebrideans regularly (at least once a day) to make sure that they have not got their horns entangled in the wire. This could happen if they panic while being chased by a stray dog. This is also the reason why electric sheep netting is not a practical option for horned sheep. You will also need some additional basic equipment - a few hurdles, a drenching gun that will also apply fly strike protection, and some foot shears (the small lambing ones) would be a good start. Recent advances in sheep footcare has shown that it is better to treat individual sheep as they become lame. Suprisingly, farmers who regularly trim the hooves of their whole flock tend to have a higher incidence of lameness in their flock. This research has led to a new set of new guidelines on how to manage lameness in your sheep. 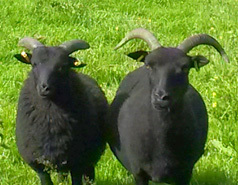 If you are interested in Hebridean Sheep, then please join the Society. It exists to promote the breed and is the registration authority for the breed within the UK. 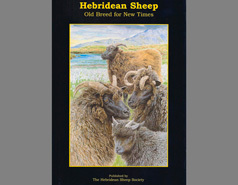 Remember, The Hebridean Sheep Society is here to help you. Please contact us if you have any queries.